Motorola claimed that reduce mobile phone camera has a good ability. Ready to compete in class 5 megapixel camera. Motorola ZN5 revealed to the market with the support of Kodak, digital camera manufacturers that have been long enough in the photography world. As Motorola's first series to bring the most advanced camera, Motorola ZN5 is ready to compete in the segment of the mobile phone camera is quite hot. 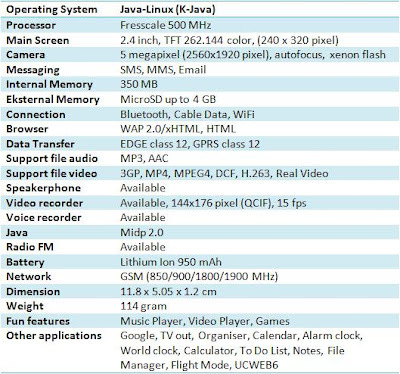 Although the camera phone with 5 megapixel strength has been shown, for example, the Nokia N95 and Sony Ericsson C902i, but remain optimistic Motorola Motorola ZN5punya interesting market power. Motorola ZN5 mobile phone ROKR adopt a little, a candybar shape with a little broad and flat. However, some sections with rounded texture on the phone makes it appear a little better than the ROKR. Moreover, the phone is trying to design a look stiff elbow. Motorola ZN5 looks robust casing material with a gray with a dark layer on the metal edge. Meanwhile, on the back of the store on the weapons are the 5 megapixel camera appear slightly swell and become the largest sector of the mobile phone body. Motorola ZN5 also offers a special key to lock the keypad and special keys and the camera is installed purple cross with the bevelled corner on the body. Also available is the volume key, micro USB slot and 3.5 mm jack for audio, and also can be used for TV out port. Like some Motorola mobile phones in the market, features ModeShift developed also on the Motorola ZN5. Outside keypad and navigation have some additional buttons that can appear at any time as a review key, delete key, simple share key and preview key. Front surface of the phone was flat, not only the display area also includes a navigation key, keypad and control buttons. So that makes it easier, each key is represented with small dots and symbols. Unfortunately, despite using the keypad layer of rubber material, but feels less soft when pressed and a little difficult when typing. From the side view, the Motorola ZN5 with the ability to screen thousands of 262144 color TFT with QVGA resolution (240x320 pixels). Supported with a screen that has a diagonal of 2.4 inch. Screen of the Motorola ZN5 is still quite tolerable for the winner in the mobile phone features a camera, even though the market has been quite a lot of phone with diagonal broader support for the visual sector. So that the operating system running well, using Linux on the Motorola phone Motorola ZN5. Unfortunately, the performance was still not able to rival Symbian mobile phone, especially in terms of the interface. Display the menu and standby screen still less dynamic and less creative. There is a 500 MHz processor Fresscale Motorola ZN5 make the access and operation of the phone so quickly. At least this is a mobile phone does not slow when used to access the menu and use the applications available. Motorola ZN5 the 5 megapixel digital camera, Kodak adopted the technology. No wonder if the main attraction is the mobile phone in the focus on the sector from the application image to the output. Kodak made several applications can be enjoyed in the Motorola ZN5. Such as Kodak Perfect Touch to edit the image that looks less perfect. The Kodak Gallery to upload images to a server owned by Kodak and the Kodak Easyshare, which allows to edit, print, share and transfer images saved in the Motorola ZN5. Motorola ZN5 camera able to produce images with maximum resolution (2560 x 1920 pixels). Several times zooming, the image is quite optimal. Outdoor photos in the afternoon is also good. Satisfactory results can also be obtained in minimal light conditions, support the existence of a Xenon flash lamp is quite good. When printed, the photo camera Motorola ZN5 quite clear and sharp. If compared, the result is still better than the mobile phone Nokia N95 or Sony Ericsson C902 is also a 5 megapixel strength. Some functions such as autofocus, Brightness, Contrast, Low Light, Geo Tagging, White Balance, Digital Zoom, Panorama, Macro, Multishot and Effect. ModeShift also support features that can activate a special button when the camera work. In addition to photos, Motorola ZN5 can also produce video, but a bit disappointing because it only relies on the ability 144x176 pixels (QCIF) with 15 fps. The result, recorded a little unclear and less focus. This situation shows that the video be part of the less optimized by Motorola. On the Motorola ZN5, some multimedia features. Even for the music business, not less ZN5 Motorola ROKR's. Interface interesting on the phone in the support facilities such as Shuffle, Equalizer, Playlist, Bass Boost and Spatial Audio jack port including 3.5. Motorola ZN5 not only provides the key to music. Voters who have come out well, with the loudspeaker of a separate earpiece. Moreover, Motorola ZN5 was also equipped with the ROKR stereo headset that is capable of removing the optimal sound. Alternatively Motorola ZN5 features include FM radio and video player that can play video with MPEG4 format and Real Video. Storage room into one of the highlights this phone, see the internal memory reaches 350 MB. Look big enough when compared with its rivals the average carrying capacity of under 200 MB. Compare with the internal memory the Nokia N95 and Sony Ericsson C609i which has only 160 MB of storage space. Not only that, Motorola ZN5 also include a 2 GB MicroSD in the sales package. Unfortunately, to access the slot is a little difficult because the battery must be opened first. Like usual, Bluetooth and data cable into a standard pledge Motorola ZN5 mobile phone is used to send data. Both this facility can work well and able to work optimally. Interestingly, when you access through the data cable supplied in the sales package, Motorola has some other type of connection between the Kodak EasyShare, media synchronization, memory card, modem, cable, equipment, and the modem and equipment. 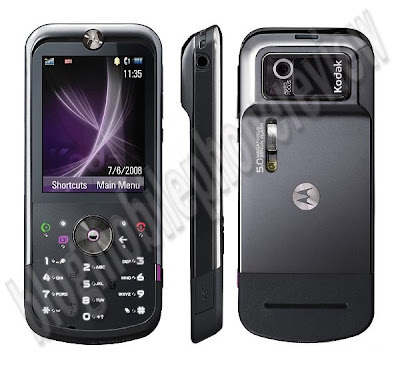 Browsing in the sector, strengthen the presence of receiver WiFi capability Motorola ZN5 roaming in the virtual world. Unfortunately, the ability to browse, ZN5 only rely on strength at the class 12 GPRS and EDGE class 12. Not only the term 3G let alone HSDPA. Ability to complete the connection, Motorola ZN5 also has a TV Out feature. By this means, both the photo and video camera can be displayed on the television screen. Moreover, cable TV is out already included in the sales package. This is supported by mobile phone battery Lithium Ion 950 mAh. This power source can still support the ZN5 that require relatively large power. Once in the charging, the phone is able to survive for 1.5 - 2 days. With no record of one of the redundant features. Motorola ZN5 ability to show images with optimal quality can be a sufficient security. 5 megapixel resolution is good enough it has a role as a main weapon. When you compare the product with the other 5 megapixel, ZN5 can surpass its opponent. However, in terms of the completeness of features, the phone must still work hard at his face competition such as Nokia N95 and SE C902i. absence 3G or HSDPA capabilities and a video that can be a less optimal constraints.